Returned items are subject to a 30% restocking fee. Some items are not eligible for returns. 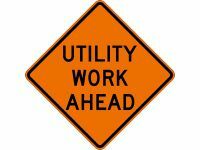 Dicke Safety Products 48" Superbright Reflective Orange Roll-Up Sign - "Utility Work Ahead"